I love superlatives. If Madonna is a material girl, I am a superlatives girl. So, you can imagine my delight when I came across the words “the largest found to date in all of North America.” (I was going to say that there might be several things when described as “the largest in North America” would not make my heart beat faster, but upon reflecting I couldn’t think of a single one.) The particular I refer to is not only large to begin with, so “largest” is really meaningful, but also old – to the tune of about 12,500 years! Obviously it is not a dinosaur (much too young for that)! 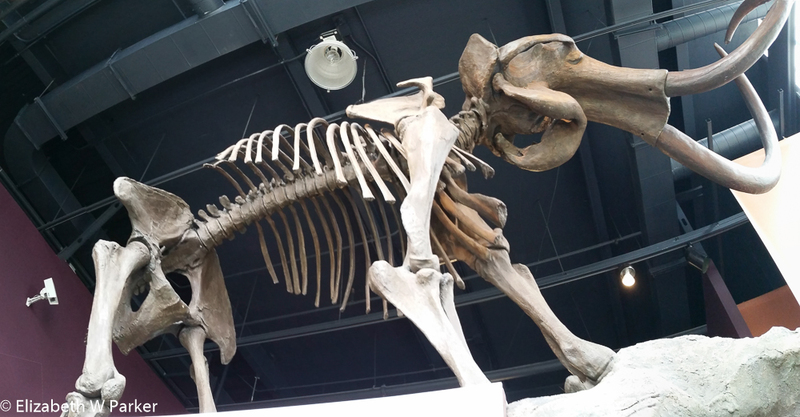 I hope I have piqued your interest…It’s a mammoth skeleton. A mammoth mammoth skeleton to be exact! A perhaps dull bit of background as to how I discovered the existence of this skeleton will set the stage. I was reading a textbook (a quite interesting one) about the history of Wisconsin. I do not know for what grade it was written, but the book is a handbook for students and teachers to encourage further research into history, and each chapter includes a inset that talks about how to get started on further research, citing both primary and secondary sources for more information! Lo and behold the very first chapter, covering prehistory, is about not one, but two, mammoth skeletons found on farms near Kenosha, WI. Wow! Have you even ever heard of Kenosha? (Probably yes if you actually have ever lived in WI, otherwise you might be thinking Oshkosh, like the clothing line. We have such odd names here in Wisconsin. But Kenosha is actually a real place, located on the shores of Lake Michigan just north of the Wisconsin-Illinois state line.) Kenosha has a Public Museum, and in that museum, which is free for a donation, one can see the mammoths. I had to go, because as you know I take my blog quite seriously and I wouldn’t want to leave my readers without my sage thoughts and deliberated opinions on just about anything or everything that strikes my fancy, museums being high on the list. So I went to see these mammoths. 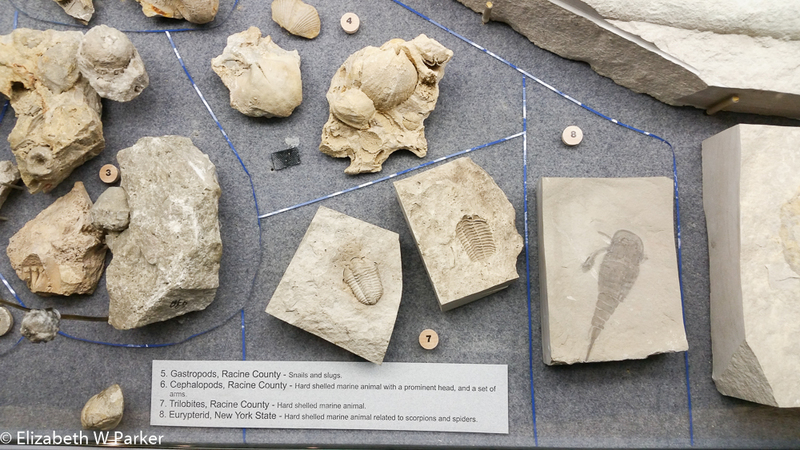 Some of the many fossils in the showcases. First, here’s a bit about the exhibit. The mammoths do not appear in isolation, but as almost the culmination of an exhibit on the prehistory of Wisconsin. I carefully perused the exhibit and learned a great deal. The exhibit is carefully done, and a critical eye reveals a great deal of information, at the same time that actual artifacts and other visuals are placed at eye level for elementary school children. In other words, adults will not be disappointed. If you are like me and tend to read everything as well as look, you would be advised to visit without the accompaniment of small children, which is not to say that you should not take them to see it. Just, that expectations will be different. Given the price, you can always visit more than once! 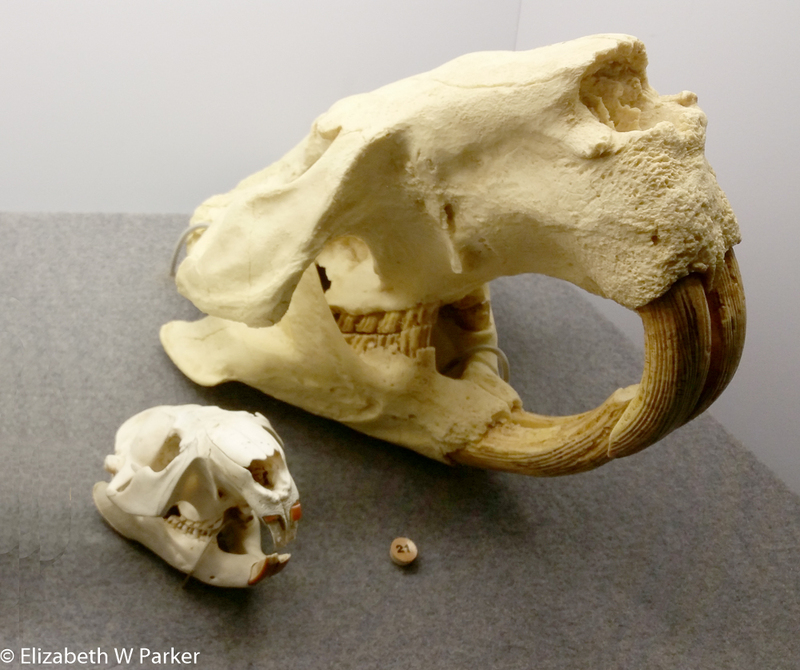 I don’t need to tell you which is the extinct giant beaver and which is the current one…do I? From Wikipedia: The Silurian is a geologic period and system that extends from the end of the Ordovician Period, at 443.8 million years ago (Mya), to the beginning of the Devonian Period, 419.2 Mya…The base of the Silurian is set at a major extinction event when 60% of marine species were wiped out. 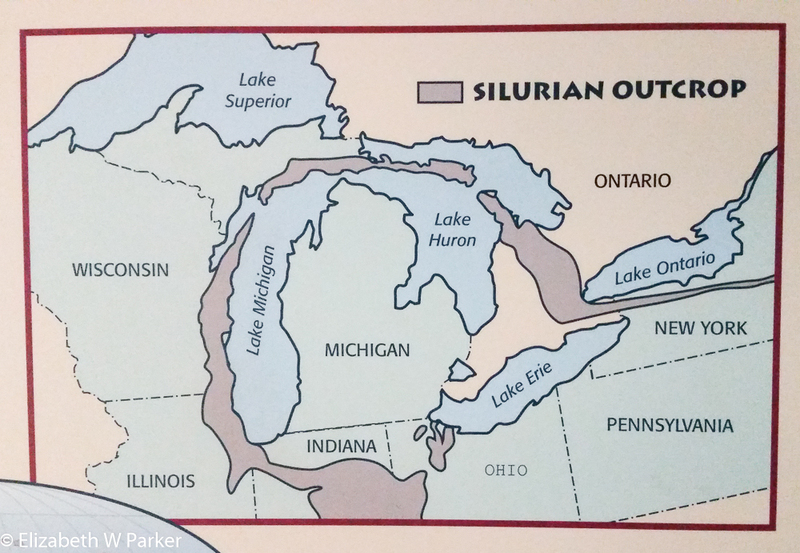 See Ordovician-Silurian extinction events. A significant evolutionary milestone during the Silurian was the diversification of jawed and bony fish. Life also began to appear on land in the form of small, moss-like, vascular plants that grew beside lakes, streams, and coastlines, and also in the form of small terrestrial arthropods. And finally you arrive in the alcove which houses the skeleton of the largest mammoth found in North America – or more exactly, the replica. Though displayed higher than the floor where you stand, and despite the walkway which allows you to wander around it, I felt that it would have been more majestic and imposing, in a much larger room. I could not get far enough away from it to take a decent picture (my excuse for the quality of the one I will show you here and no sense of scale). Remember I said there were two mammoths? They actually have names, derived from the farms where they were found. The Schaefer mammoth is the “smaller” of the two, and it is displayed (a replica also, one would hope) according to the bone pile the archaeologists found. The Hebior mammoth, “the largest ever found in North America” is assembled. The actual bones of the Hebior are the property of the Milwaukee Public Museum, the Kenosha Public Museum owns the Schaefer bones. I also found the history of the bones interesting. From their initial discoveries to their current conditions, their story tells much about the people involved and the institutions, and not all of it flattering. The stuff of a good novel? The exhibit continues covering early humans in the area, including Aztalan (another subject I have covered in the blog) and the middle Mississipians, continuing right up to the more recent times with the advent of Europeans into the mix. But, what about the mammoths? What is a mammoth?? Well, it is not a mastodon. That is a different animal. 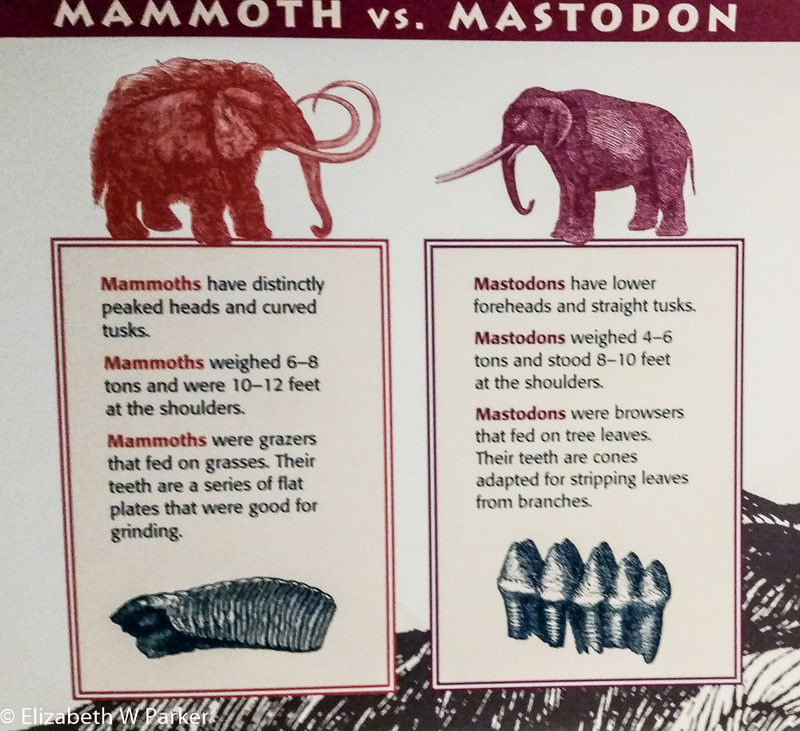 The exhibit carefully explains how the two are different, and how they were able to coexist, despite their enormous sizes (and hence appetites). That is, they did not eat the same things. Mammoth ate grass and mastodons ate leaves. And yes, modern elephants are descended from mammoths. Are they woolly mammoths? No. They are called Jeffersonian mammoths, and they have the characteristics of both the woolly mammoth, which hailed from more northerly realms where it was cold, and Columbian mammoths, which hailed from balmier climes. 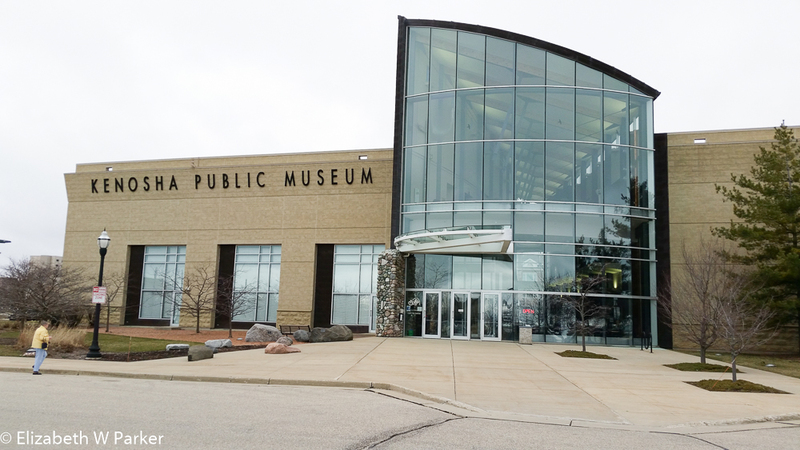 I do encourage you to make a trip to Kenosha to see the mammoths, to see the Kenosha Public Museum, as well as its sister museums, the Civil War Museum, which is right next door and the Dinosaur Discovery Museum, which is just blocks away. Take the whole family as there is literally something for everyone, as well as beautiful views of Lake Michigan (not however the day I was there). If you also discover a good place to have lunch – please let me know as I intend to return as well. My final comment is yet another question: How is it that I grew up in Wisconsin and didn’t know any of this?